the same function as that of the Venus Fly Trap. Small swimming organisms touch the trigger hair on the inside of the trap. The trap has the ability to close extremely fast in order to catch its prey and then digest it. 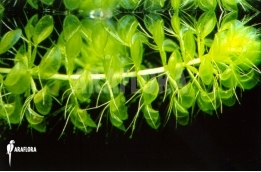 For additional information about the cultivation and care of this carnivorous plant as well as the exotic plants Araflora is offering in this category, please find the below Araflora productinfo and Araflora plantcare sheets. If you are looking for one specific species, you can look for it on this website using the PlantFinder. Click here to open it.